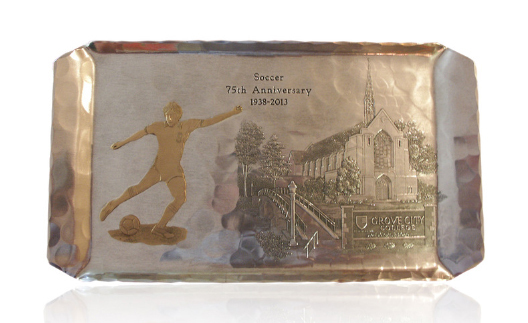 GROVE CITY, Pa. -- The 2013 season marks the 75th anniversary of the inaugural year of men’s soccer as a varsity program at Grove City College. Coach Bob Thorn led the 1938 team to a 1-2-1 record, including the first win in program history over Slippery Rock State College. More than 500 wins and 10 postseason appearances later, the men’s soccer program has consistently stood among the top programs in the region for the duration of its existence. For more information on the 75th anniversary of Grove City College men’s soccer, check out the most recent edition of “Center Circle,” the Grove City College men’s soccer newsletter. In addition, for those wishing to commemorate the event, Wendell-August is selling 75th Anniversary Bronze Hostess Trays, as seen below. Click the image to visit their website for more information.